The veterinary Internal Medicine specialists at the NC State University Veterinary Hospital specialize in the diagnosis and treatment of serious health problems of dogs and cats. Operating as a specialty referral service, all clients require a referral from their primary veterinarian. 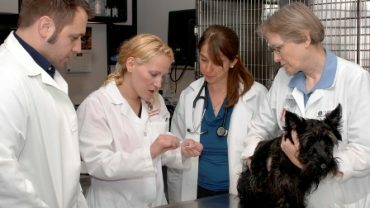 We utilize a team approach to patient care which includes a senior veterinary student, intern or resident (DVMs undergoing advanced training) and faculty member in conjunction with the primary veterinarian. The specialists at the VH are innovators within their fields and are involved in many new techniques. 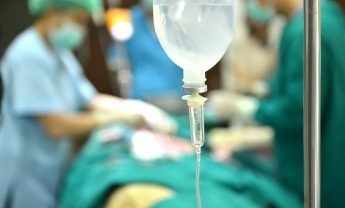 If the doctor feels that a new procedure or technique will benefit the patient, the implications will be discussed with the owner in depth so that they have all the information necessary to help decide whether or not the pet will participate in any on-going study. The patient’s health and comfort is the primary factor in all decisions. When your primary veterinarian is unavailable during regular business hours, we offer a triage service. Same-day admission of emergency and critically ill patients is available, we work in collaboration with your primary veterinarian on a treatment plan. Our intensive care unit is fully equipped to provide state-of-the art care for critically ill patients. The unit is staffed around the clock by 12 veterinary critical care technicians and supported by an animal blood bank service. 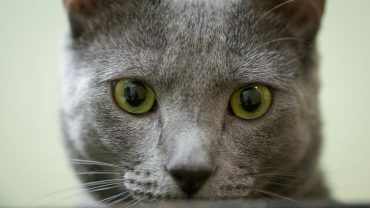 Hyperthyroidism is caused by a thyroid tumor (usually non-malignant) and is currently the most common endocrine disease in older cats. 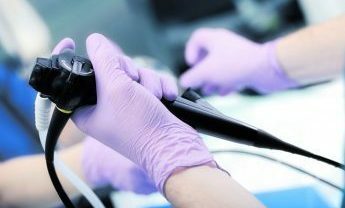 Clinical signs are progressive and can be severely debilitating and potentially fatal if the disease is left untreated. 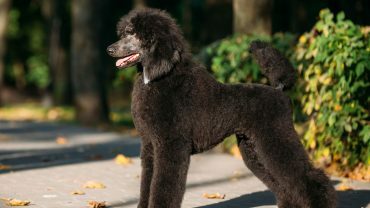 Researchers in the College of Veterinary Medicine are working to identify the gene mutations responsible for the development of Addison’s disease in Standard Poodles. The Internal Medicine Service is a referral only service available Monday through Thursday. Please have your primary veterinarian contact us by phone or fax with the referral information. After the referral is made, you can call 919-513-6670 to schedule your appointment. If you do not have a referral and you would like your pet seen by a specialist, ask your veterinarian to set up the referral. The Internal Medicine service cannot provide advice to clients over the phone for patients we have never seen. We may be able to facilitate an appointment or provide a small amount of general information. It is often difficult to judge the correct approach to a situation without the opportunity to gather a complete history and directly examine the patient. When calling, please keep in mind that due to the high volume of cases seen we may not be able to answer the phone, please leave a message and your call will be returned as soon as possible. Patients are admitted at the front desk of the Small Animal Hospital located in the Terry Center. After the patient has checked in, a Clinical Technician will take the owner(s) and patient to an exam room. A senior veterinary student, (Intern), will enter the exam room to obtain a complete medical history and perform a physical examination on the pet. Due to the fact that we are a Teaching Hospital, it is very important to provide the students with this experience so they can provide the best care possible to their future patients and, in doing so, maintain the high standards of the veterinary profession. 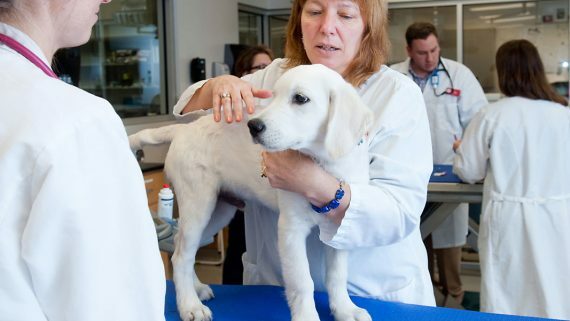 The student will then leave the room to discuss the case with the attending veterinarian, (Resident or Faculty), which may take up to 30 minutes. The student will then return to the exam room with the doctor to discuss their recommendations for the pet. Owners should be prepared to spend 2-3 hours with us for the initial appointment. Please bring copies of your pet’s medical records from any veterinarian who has seen your pet for the referred problem. Also bring any diagnostic test results, including blood tests, radiographs, ultrasounds, and biopsies. 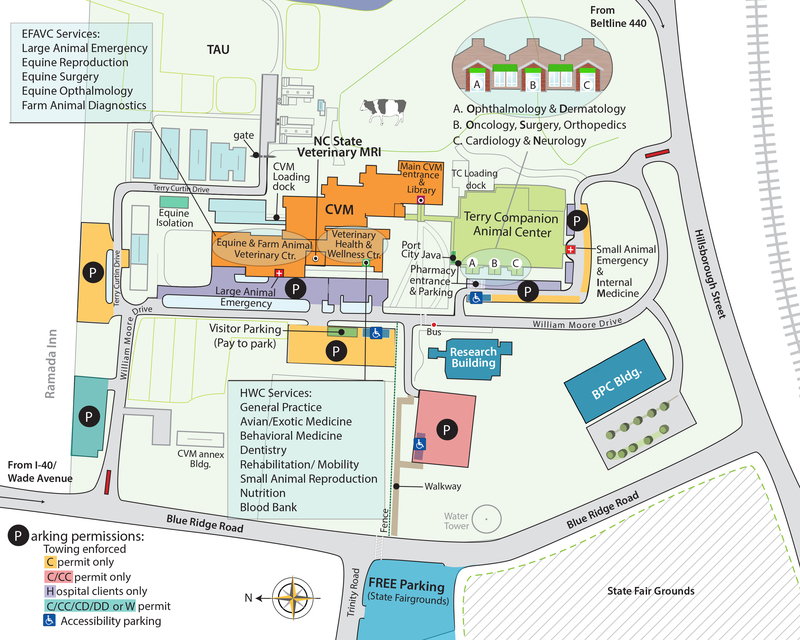 The VH is a not for profit health care center and receives less than 2% of operating costs from the the State of North Carolina. The majority of our operating costs are paid by client fees and donations. In fact, many of the state-of-the-art diagnostic and treatment options we offer are only possible because of generous gifts from our clients. Our fees are set to cover the balance of our operating costs, and we are always looking for ways to provide better service at lower cost. Total costs are comparable to those of veterinarian specialists in private practice.